As a vegan, the question "where do you get your protein?" is one of the most common and frustrating things you'll hear. If you're eating a whole foods plant-based diet that's full of abundance in the form of fresh fruit and vegetables, grains, nuts and seeds then you'll hit your protein needs with very little effort (as long as you're eating enough food!). However, depending on your goals, you might want to add a bit of extra protein into your diet; a good quality vegan protein powder is a fab way to do this because it's super easy to add to meals you'd be eating anyway such as oatmeal, waffles, smoothies, banana ice cream and pancakes. I love having a scoop of protein powder with my breakfast as I find it keeps me full and satisfied and gives me lots of energy to power through my day. 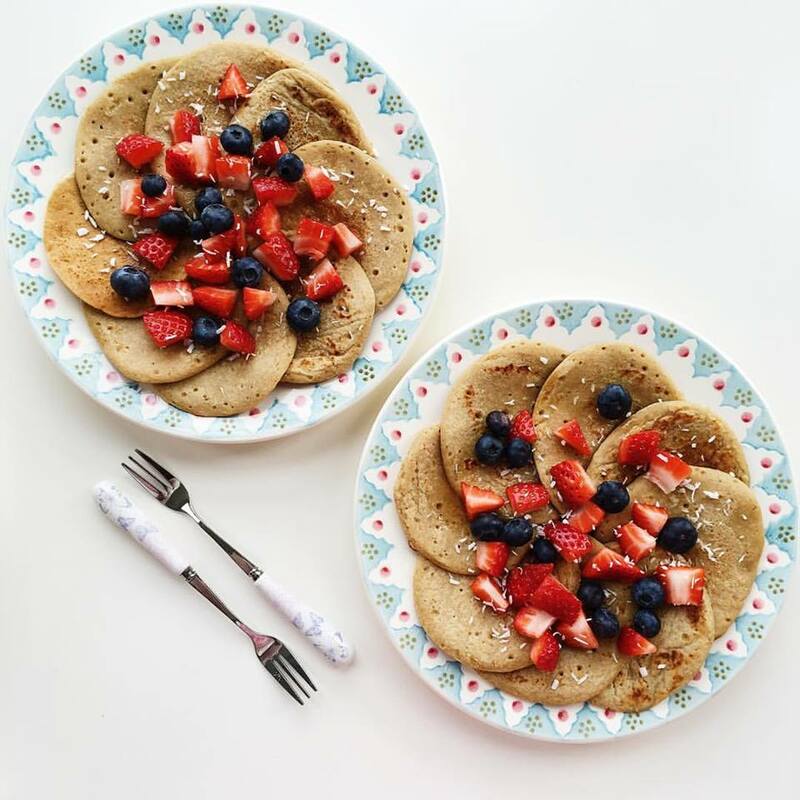 This protein pancake recipe is a Sunday brunch favourite and it's boyfriend-approved too! When your flax eggs are ready you can begin making your pancakes. Firstly, add the flour, baking powder and protein powder into a large mixing bowl and stir them all together. Mash your banana into a pulp (you can leave behind a few slices to top the pancakes with if you wish) then add it into the bowl along with the non-dairy milk and flax eggs. Mix well until everything is combined. Heat your oil of choice in a frying pan over a medium heat; I have a non-stick frying pan so I only have to use a tiny amount of oil but you may need to use more if you don't have one. When the oil has heated up pour about 1/4 cup of the batter per pancake into the pan - I usually manage to fit 3 pancakes in at a time. Let them cook for a minute or two, until bubbles start forming on the top, then flip them over and cook them for another minute or so. Repeat with the rest of the mixture, then add your toppings and enjoy! These pancakes look amazing! Definitely going to try them out with chocolate or cinnamon protein powder!